The activity adheres to the resort’s pledge to use 80% locally sourced products. 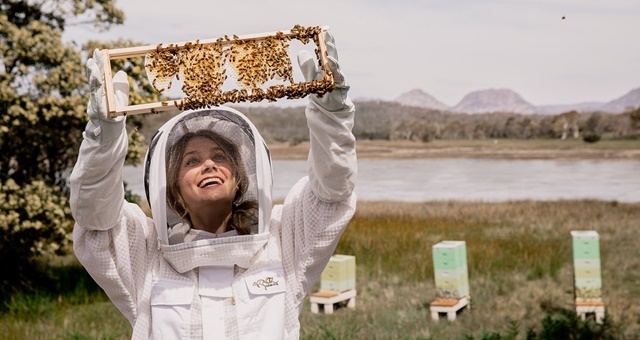 Honeycomb fresh from the hive can be harvested by guests at Saffire Freycinet as part of a new immersive guest experience on offer from the Tasmanian luxury lodge. The experience allows guests to get up close to the property’s commitment to source at least 80% of its produce from local sources. Produce is then transformed into the daily menu by Executive Chef Iain Todd. The on-site hives each contain more than 60,000 bees working to create honeycomb. Guests can indulge in the activity while overlooking the Hazards of Freycinet and under the tutelage and care of Saffire Horticulturist, Rob ‘The Bee Man’ Barker. In addition to the apiary experience, guests can also opt to don waders and venture into the hotel’s oyster farm to help draw oysters for the day’s catch. Saffire General Manager Justin King said the beekeeping experience was born from a local supplier, Rob, trying his hand selling his locally produced honey at their front door.